We really did it. 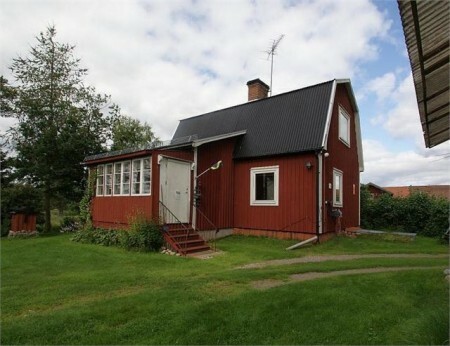 We bought a house in Sweden. This has long been a dream of mine. 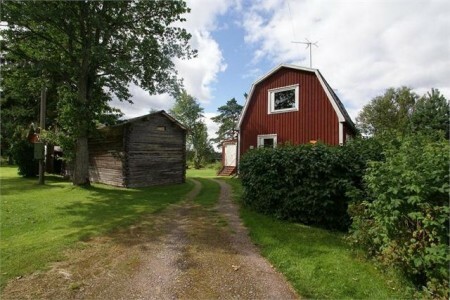 I fell in love with a different house on a real estate website and we went to Sweden intending to buy it. However, it didn’t live up to the photos, so, disappointed as I was, we said “no.” Luckily, there were two other possibilities. I love the setting of this one. The house and outbuildings surround the yard. The house was built in 1930, and an addition, including the porch and an entry hall seen here, was added in 1989. The house is very livable, but we already have plans for some changes, including removing this porch and replacing it with something more like the original. The outbuilding on the left is made of log and part of it was built in the 1200’s! It’s hard to wrap my mind around that date. 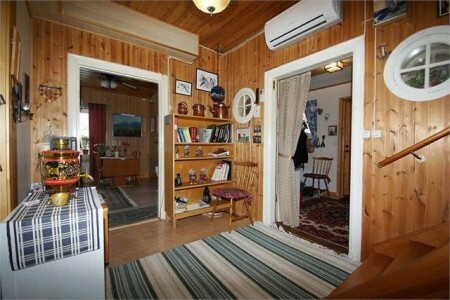 These pictures are from the real estate listing. 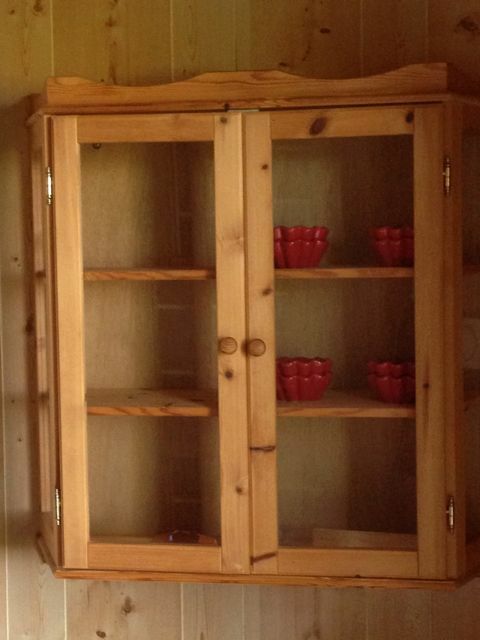 When we saw it, it wasn’t furnished. Here’s the entry hall that was added in 1989. The two round windows were originally on the outside of the house. 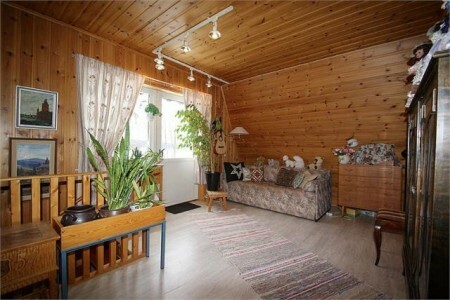 The living room is a nice size, as it used to be two rooms–the living room and a bedroom. The short wall behind the corner fireplace used to extend across to divide the two rooms, and it’s kind of awkward with the fireplace sitting at an odd angle–something we plan remedy, although we don’t have a definitive plan for it yet! 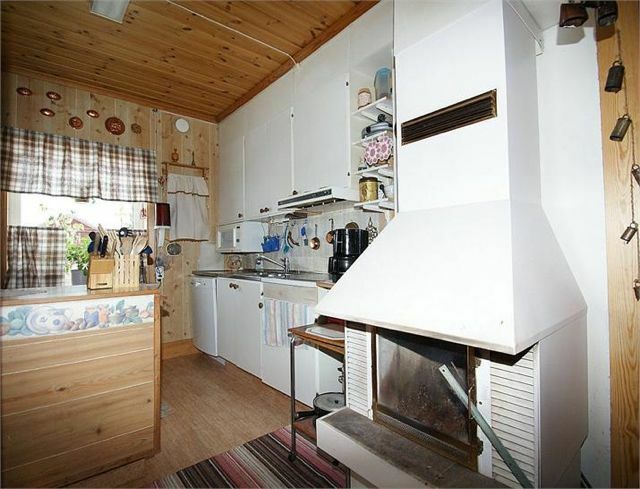 This free standing fireplace is in an odd location–the doorway that leads to the kitchen. It was part of the 1989 remodel and was attached to some ductwork that helped spread the heat throughout the house. 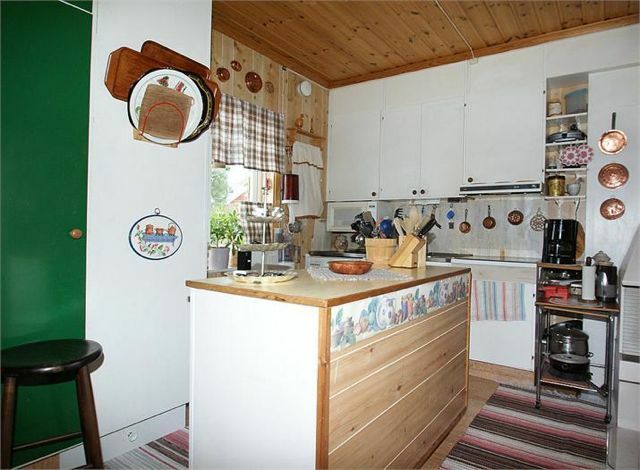 The kitchen was rather awkwardly laid out without much counter space. 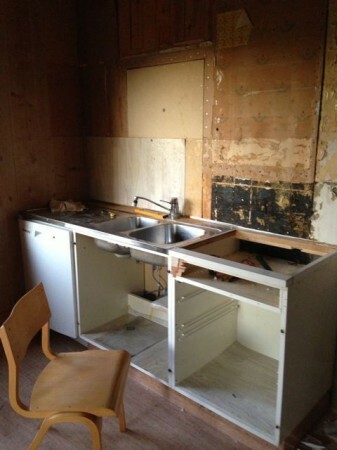 I’m sure the island was there to remedy that problem, but it made it hard to move around. We only had possession of the house for two days before we came home, but we have entirely removed the kitchen and made plans for a new one! The dining room is a part of the 1989 addition. There is a ton of built-in storage along the right wall. The sellers left us the table and chairs and the little cabinet on the left wall, so we’re not entirely without furniture! The other part of the addition was a bedroom and three bathrooms–two down and one up. Upstairs, at the top of the stairs, is a bonus room. The doors to the left lead out to a deck that looks toward the river. I can’t wait to sit out there on a warm summer morning, enjoying a cup of coffee. 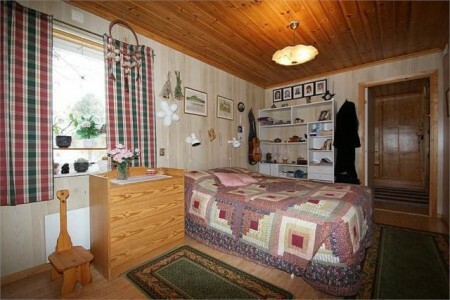 Here’s the upstairs bedroom. I think we’re going to have to fill it with beds and make it dorm so everyone can come visit! 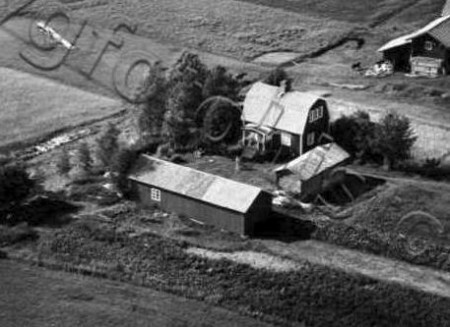 So many of the homes I’ve visited have aerial photos taken in the fifties. 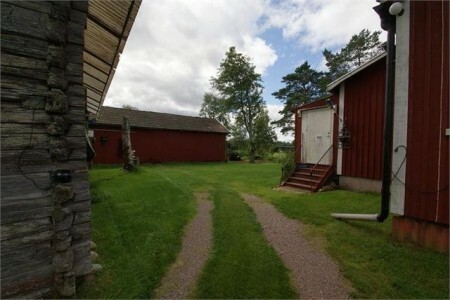 I stumbled onto a website that has thousands of them, and found one of our house! I’m going to order one to hang on the wall. 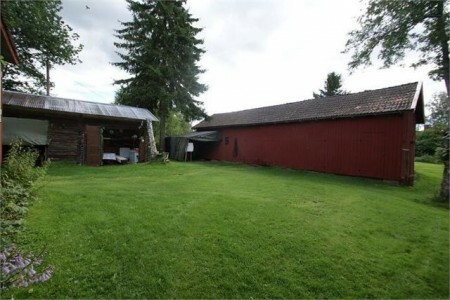 If you look closely, you can see the original porch. So, what was my first purchase for the new house? 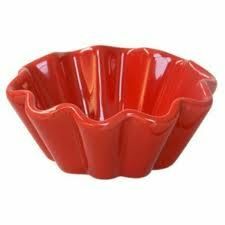 The little tart forms you can see in our China cupboard! Here’s what they look like close up. Perfect for individual apple pies! The second was a pair of chairs from a loppis, a kind of permanent garage sale. I can’t wait to get back do more! Connie, I started drinking coffee in Sweden this summer! Karen, it will be so interesting all of your remodeling progress. You and Bob will do an outstanding job I am sure. CONGRATS! Talk about living the dream! We are happy for both of you and can’t wait to watch your progress. So cool, Karen. And that bonus room upstairs will make an great quilting room. I can see Bob out there with his John Deere just puttering around. Do you need someone to housesit for you at the beach next summer? Just want to get on the list! Congratulations, Karen! I’m so very happy for you. What a dream fulfilled. I will continue just to dream. Looking forward to more pictures in the future. I am so excited for you and can’t wait to see it after you’ve had a chance to decorate it. I know it will be a work of art! Don’t anybody get too excited about having coffee with Karen. I’m pretty sure she hasn’t had more than three cups. She is doing her best not to make icky faces with each sip. So much fun ahead of you. You will make it beautiful. Karen – Is there a sign-up list for guests yet? If so, I want to be on it; after you’ve worked your decorating magic on it, of course. How very exciting, Karen! 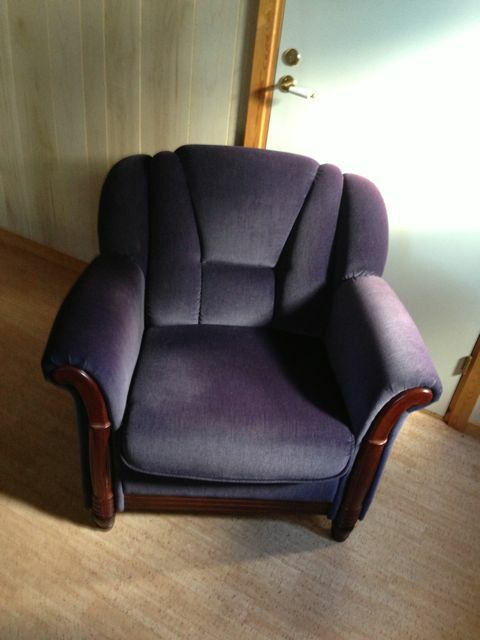 Love the style of the purple chair….but was surprised the color was not ORANGE. 😉 I know you will have a ton of fun decorating your new home. Hope you’ll continue to post photos…..
That is living the dream! Congrats! How exciting about your house in Sweden!!! 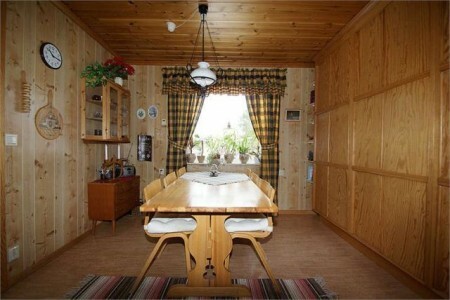 I would love to move back to my “roots” in Denmark – island of Mon. Perhaps if I win the lottery. I don’t even have a passport! But my brother and cousins have maintained contact with the relatives in Denmark. 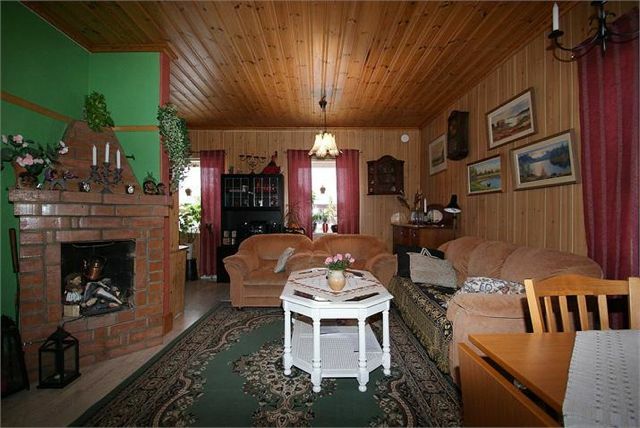 Things seem so much less frantic in Scandinavia. It was only a matter of time…Congratulations and may you have wonderful adventures in your new home! Congratulations! It is a wonderful feeling when a dream is realized. Hi Karen!! Your new Sweedish home is darling!! I’m so very excited for you! This is going to be exciting to watch the progress and see pictures and read your tutorials. I love that! I had to smile at your new little tartans for your kitchen………of course they’re orange! 🙂 Love the chairs! I’d love to have coffee with you on the deck! Have fun!! So glad your dream came true!! When can we come see you in Sweden? A bed and meals provided of course!!! 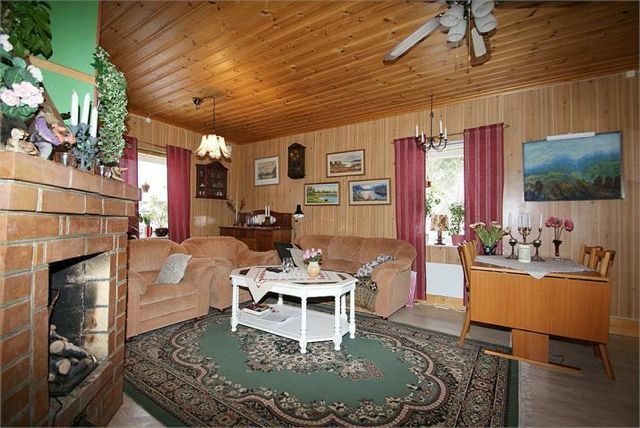 Looks a little like Charles great aunts home in Sweden. They still live there, although they are in their 90s now. Karen, your new home is lovely. I am a Swedaphile (is that a word?) and it was fun to see a home that reminded me of those I’d read about in Swedish literature..Enjoy it as I’m sure you will…. 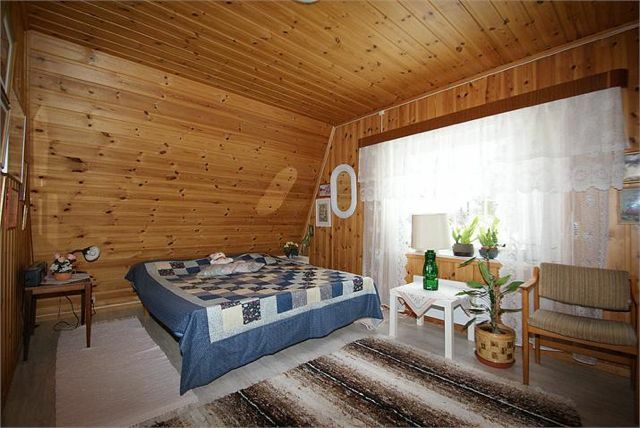 Looks like there was a quilter living there before you, and now another one. Congratulations on your new/old home. Isn’t funny how we are returning to the countries our ancestors left. Congratulations! I especially find the ceilings to be so charming! It appears that they are made of solid pine – knotty pine, actually. The house looks very clean & comfy & utterly charming! The grounds are lovely – I imagine the winters are quite snowy! Perfect for settling down to some serious quilting! Wow! I smiled my way through these pictures, Karen. Now I’m curious to know where the house is in relationship to anything else.